Hey its great that you fixed up this mod but I have noticed the salamander missiles don't get reflected by the repulsor very well and was wondering if that was intentional. Oh alright but another thing I have notice is that I can't can't interact with the association planet /or space station. so I can't sabotage or use agents on them or do missions with independent actors on them. Why fractions of it mod such weak? Everything that they are able to do it perfectly to blow up but their fleet doesn't pose any threat. One have no shield, others have no mobility. And both have weak arms and active sustem. Maybe it is worth giving "Exigency Corporation" armor restoration, and "Ahriman Association" to give the normal competitive ships? At them even cruisers can't be at war with destroyers. I a Russian. And i communicate with the help of Promt Translate. And I am a color-blind person. What are you using to fight them? "A story teller and a trader. Tell me your tales and I'll tell you no lies." Come join the Starsector Fan Chat! It's decently active. "Dragon", "Infernus", "Onslaught" and him similar. And everything that I see in fight is constants the message on death of my enemies. It is a lot of messages. Just whipping boys. And it in spite of the fact that I use "Dynasector" and my enemies have the 36lvl of officers. I have experiences of this, they're more based around playing smart, even I can't do a full on Nexerelin Exigency playthrough, becuase the hulls on the ships can't take much hits because of armor being destroyed so easily. On the plus side, the 3 most useful ships i've seen so far out of this faction are the Indra, Xyphos and Irithia. I vanquised Teresa Terror's IBB fleet thanks to the Irithia and struck her down first, but most of my fleet perished early. Thankfully, the hull regeneration stacks very and I mean VERY favorably with the 0.5 seconds hull regen, which means if health isn't full, the Irithia repairs like crazy. Xyphos are good for flanking and skirmishes, not pure battle, unfortunately. Treat them like a sub-par Medusa with a different shield system. The Indra is the real star of the Exigency Corporation faction mod, however, due to it's Burst Maneuvering Jets and the Burst Repulsor. The Burst Jets it has on it allow it to get in and out of a situation, all while taking out ships without sufficient armor to hold off the assault from the CIGEN Repeater when it closes in. The Burst Repulsor, being more effective for repelling ordnance, allows the Indra to be a last minute Aegis against ordnance from bombers, MIRV's and even Reaper Torpedo's. Now, if you ask me, not many of the other ships are even worth mentioning remotely, aside from the Pergon and it's CIGEN Cannon, due to partially being useful because of the long-range capability of it's CIGEN Cannon. I haven't gotten any Ahriman Association ships yet, and don't plan to. I think the best strategy for a pure playthrough is just stack Battlecarriers. They're the only hull that seems to repair fast enough to withstand an assault for long enough that the allies can help the ships under attack. IBB of a mission not an indicator. They are insufficiently difficult. "Indra" this the best that it has a mod but is one but. On him it is impossible to kill even the cruiser. And a fight with a destroyer already risk. For example "Sunder" with "High intensity laser" will kill you with 100% guarantee. It will be necessary only to run it is impossible to reach him enough fast before he kills you. Battlecarrier Irithia - it is the worst carrier from all. There are no arms. There is no survivability. There is no speed. And self-destructive AI. Teleport to itself "Onslaught" which kills this trough in seconds? Of course! It is ingenious! But only present what with these fractions is done "Kngiht Templars" in battle. It is just blood, guts and meat. Establishing this of fashion I thought that I will receive one more interesting, evil fraction as the strong opponent (as Templars) and have received enemies of which even to kill is uninteresting, and to play using their ships it is impossible in my conditions. Just think. What to be at war with such stuff against the opponent having characteristics equal to the player and in such quantities. In such conditions it is very well visible what the vessel is capable of. 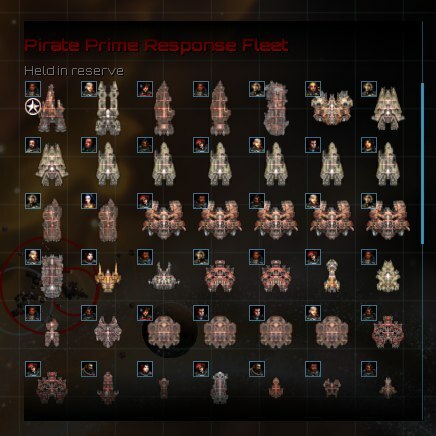 The ships of it mod are only capable to explode. I'll just quote my post on Exigency, it's a bit old, but still relevant i think. I played a Nexerelin campaign with Exigency and reach level 42. Early game is, as expected, incredibly painful for Exigency ships. Even a bunch of Hounds can be a serious threat to a lone Yria as the repulsor isn't a reliable defense system. I tried at first to farm pirate bounties like i do with any factions but it didn't really worked. Yrias and Elhiurs are defenseless alone. A Zephos can work as it can constantly teleport in the enemy's back but only if it's 1v1, it also get shredded when outnumbered. So i decided to trade food to earn enough money to afford my first Nasir with two fighter wings. Things went much better after this. I think it's actually impossible to play without fighters as they can act as a meatshield for the rest of your fleet. I would have liked to find more Kaivor as their ability to spam Mx missiles and their repulsor was all an Exigency fleet could dream of. Alas, a bunch of Glynado will do for now. I didn't really wanted to go full carrier, so i also bought some standard ships and glued them around the Nasir to form a protective deathball. The Zephos have been my flagship for nearly the whole campaign. Mounting a dual Typhoon on that thing was very tempting but i decided to only use Exi weapons. I went first with a modified Brawler variant with two Vindictive arrays which worked pretty well. 500 DPS for 100 flux/sec and the price of an Arbalest AC was quite beastly, especially since i could teleport in the back of enemy ships with frontal shields. The only problem was that the VA is a PD and had the bad habit to track missiles rather than DPSing the enemy ship but it's more because i was too lazy to control them manually. This loadout worked wonder until late game when i couldn't approach the overleveled enemies flagships, even from behind. I tried to switch for a dual repulsor blaster to try those. While i was able to perform some cool tricks (threw a Kurmaraja wreckage at a Gemini, which ended up crushed between the derelict and the enemy Victory flagship) it was otherwise a very meh weapon. Extremely expensive, nearly no damage... "Repulsing" enemy shots was very difficult (and risky) on top of that. I switched to a dual Flail. While it wasn't incredibly flashy, at least i could bombard the enemy at a safe distance. 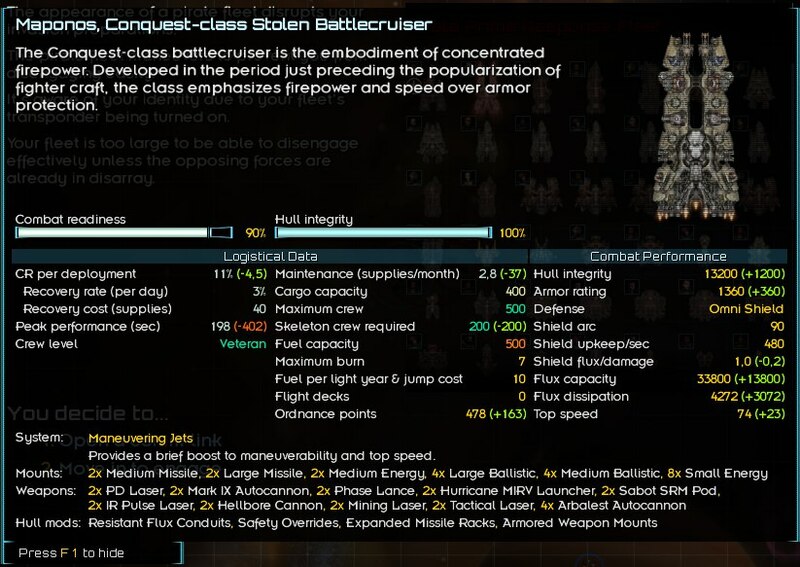 For the cruiser, i was convinced i would love the Pergon. A bucketload of Mxs, a big, long range gun, twice the hull points as a Nasir. An artillery anchor that would have been perfect for my deathball strategy. Problem, it can't aim for crap. Either i was monumentally bad at aiming with that thing (the AI wasn't exactly better) or the enemy was making absurd efforts to dodge every single CIGEN shells i threw at them. Thanks god for the Mx40 it wasn't completely worthless but i swear its main gun was cursed. I think it would really benefit from a projectile speed increase to make it less supernaturally inaccurate. And then i got the big one. And at more than 400.000 credits, it took me a while to grind but it was worth it. The Irithia is absolutely necessary for every Exigency fleets. Very tanky (for an Exi ship), a gazillion Mx missiles, 6 regenerating torpedoes and 2 launch bays for your swarm of fighters, the other mounts almost feel superfluous on it. And most importantly, the Tethys drive, which teleport enemy ships right next to you. 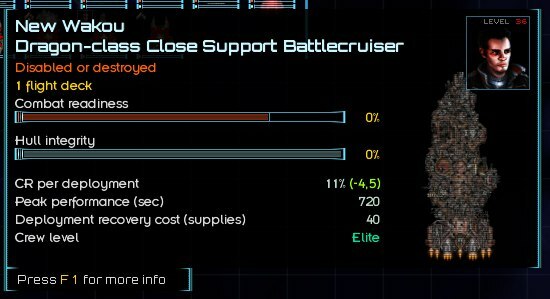 And because i was deathballing all my ships around my Irithia, that enemy ship life expectancy was usually very, very short. And they lived happily ever after and killed a lot of pirates. And i got very wealthy and i thought: "wow, one Irithia is very good, why not getting another Irithia?" And it was a very stupid decision. When the player target an enemy ship, the Irithia teleport it to your fleet, which is good. But when you have two Irithia, they BOTH try to teleport the enemy ship next to it, which end up in a massive clusterfrack where your two Irithia are playing ball with the enemy Paragon, IN THE MIDDLE OF YOUR FLEET. And because the Paragon was constantly being teleported around, my bombers couldn't quite catch it. When they did and dropped their bombs, it could be teleported to another place at any second. The bombs however, would keep going where the Paragon was, in this case, my own ship. And that's how i lost the Irithia i just bought. So yeah, only one of those per fleet. Other than this, Exigency felt pretty fun and balanced. Of course they are still incredibly vulnerable to beam weaponry, which i learned the hard way when i encountered a "Tachyon-lance party" themed fleet (1 Paragon, 1 Odyssey and 1 Apogee for 7 Tachyon lances, i didn't knew SS+ could do that kind of things) which butchered all my ships with terrifying ease. Just another little issue i noted, Kaivors are considered as bombers (they follow rally strike forces orders) which isn't wanted as they are much better on the frontline to soak up damage with the rest of the fleet. There's quite a lot of stuffs i haven't tried. No Indra for sale, no Naithyr, no Naxos either, which sadly would have worked very well with my strategy. My stations were determined to only sell me Glynados, more Glynados and then even more Glynados. Same thing for guns, lot of guns to try but not enough ships with medium mounts. Aaaand i think that's all. Exigency is adept of the deathball formation, a bit like II. A swarm of missile ships orbiting around an Irithia is one of the trickiest opponent to take down. They are hard to play, they tends to be used very defensively and love to drag on battles to slowly wear down the enemy. They're the "Gradual Grinder" faction of the game, and they're pretty good at it. Of course, they are far from invincible, beam spam or Templars ships (or both) will usually be able to crack open even the biggest Exi deathballs. As for AA, they are being reworked so it's probably better to wait for the new version before trying them. Some of the survivability issues with Exi will be fixed in .8 with the armor changes, which will allow Exi to live longer. Suggestion: Enable -limited- armor regeneration. I.E., armor regenerates up to a maximum percent of, say, 2/3 current CR. That way there's an explanation for the damage decals not going away: the in-combat repair can't fully restore armor. It wouldn't work perfectly, no, you'd still have decals matching the highest level of damage you'd taken. But that can be explained away with a bit of lore, something like: "The in-combat armor repair operates on a layered approach, 'growing' a fresh carapace inside the previously-damaged shell - a technique that, while effective, does little to restore the initial pristine lines of the hull." If that still doesn't sit right with you, you can just make the hull more durable; instead of relying on armor, build in damage reduction effects that apply to beams and fragmentation (and possibly kinetic) damage. Justify it with something like "integrated armor" - internal armor plates designed to compartmentalize and minimize damage that breaches the outer layer of armor. That is the issue. If you have been on the forum for awhile, you should know by now that Meso is an even bigger perfectionist than Alex is. This is the error in particular, it seems to be randomly triggered too. It seems to be when I trigger the teleportation. But beyond that I've no clue how to fix it.